It all started on a crazy night in Colorado. The Cubs came from behind and beat the Colorado Rockies on April 23rd for the 10,000 franchise win. Since then, the Cubs have fallen into a very bad pattern. They keep winning one game, then losing two in a row. The Cubs continued this pattern for the fourth time since they lost the second game to Colorado by beating the Reds 3-0 tonight. The Cubs are in desperate need of a series win, after losing three straight series, and definately need to bulild some momentum before facing the league’s best team this weekend, the Arizona Diamondbacks. Carlos Zambrano was able to outduel Aaron Harang in the battle of the aces. Zambrano was able to go eight innings, gave up only three hits (two to Griffey Jr), walked three, struck out three, and picked Joey Votto off second base. Zambrano is now 5-1 in the first week of May. Is this the year that the Cubs finally have another 20 game winner? It appears that Z’s shaved head has had no affect on his pitching, so any superstitious Cubs fans need not worry. The offense was able to score enough runs to back Big Z up. 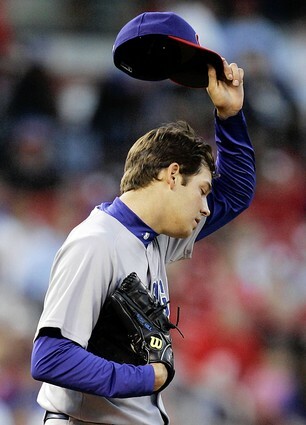 After Soriano led off the game by striking out (big surprise), Ryan Theriot singled to right. The struggling Derek Lee flew out to right, leaving Theriot on first with two outs, but then Aramis Ramriez stepped up to the plate. Ramirz had not played since Adam Wainwright hit him in the wrist with a fastball. His bat was sorely missed and after Theriot stole second, Ramriez hit a base hit up the middle for a two out RBI single, giving the Cubs a 1-0 lead. Ronnie Cedeno had the most clutch hit of the night. In the top of the fourth, Derek Lee and Aramis Ramirez both drew back to back walks. Fukudome sacrificed the runners to second and third for the first out. Geovany Soto struck out, but with two outs, Cedeno singled to right, scoring Lee and Ramirez and giving the Cubs a 3-0 lead. That was all the runs the Cubs needed as Z got them through the eighth, and on the night of ten year anniversery of his 20 strike out game, Kerry Wood closed out the ninth. This road trip has been a disaster, especially for Derek Lee, Mark DeRosa (who sat on the bench), and Fukudome. With Soriano still stuggling, the Cubs have been losing a lot of close ball games, most of them by the score of 5-3. The Cubs are 3-13 in games where they score 3 runs or less and 16-1 when they score four or more. The Cubs need to find a way to win these close ballgames. You are not going to run up the score against a playoff team Playoff games are usually low scoring and won by the team that can manufacture runs. Lou was very frank about the state of the team after Monday night’s heartbreaking loss. I agree with Pinella on this point. Most of the MLB power ranking have the Cubs in the top 5, and I don’t buy that. Not the way they have been playing lately. 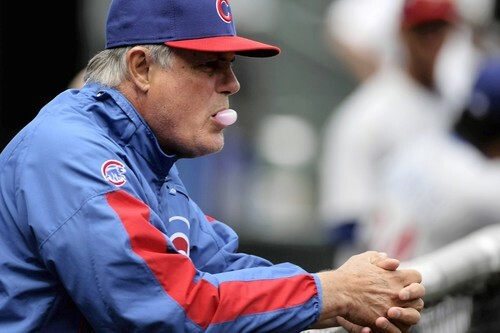 Uh-oh, the Cubbies better be shaking in their spikes, because last time Lou talked about making some changes, a lot of guys had to pack their bags. Remember last year after Lou gave a similar speech, Michael Barrett was gone, Cesar Izturis was gone, Matt Murton was sent to Iowa, Jacque Jones (who was just cut by the Tigers) was benched, etc. I hope Lou really means this, and not just to the support players, but the guys making the big bucks too. I’m looking at you Soriano. 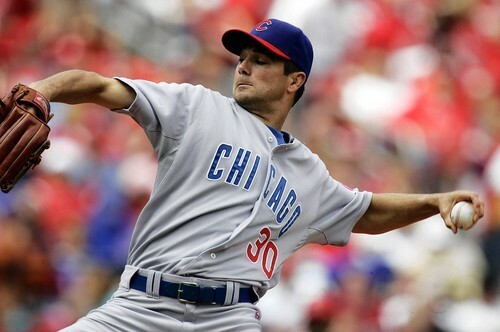 The Cubs will send veteran pitcher Jon Lieber for his first start of the season. Luckily, Z’s eight inning rested the bullpen, which means they will be fresh for tomorrow. Lieber needs to be stretched out and may not be able to go much longer than 5 innings. Other guys will have to help out. The Reds send Edison Volquez, the second talented pitcher the Reds have in their rotation, in the rubber match of the series. In the last three rubber matches the Cubs have played in, Washington, Milwaukee,and St. Louis, they have dropped the third game. The Cubs need a win to salvage something out of this disaster of a road trip. Remember mid-April, how everything was so perfect? Every break went our way and we could do no wrong. 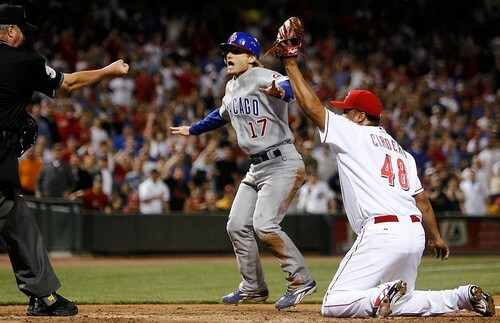 Not any more, as the Cubs continue to slide, losing to the Reds 5-3 on Monday night. How many ways can the Cubs find to lose a game? Here’s one for you. The Cubs pitchers did not give up a single earned run, but still lost the game. The offense has continued to struggle, especially with the absence of Aramis Ramirez, who had to cut his batting practice short because of the pain he still feels in his wrist. The defense really failed the Cubs, as errors led to all 5 runs. Nearly every break went against the Cubs, starting with the first inning. After getting Ryan Freel to strike out to start the game, Ryan Dempster gave up an infield single to Ken Griffey Jr. Then Brandon Phillips got an infield single. Joey Votto hit a ball to Mike Theriot that should have ended the inning, but as he was turning to make the double play, the ball flew out of his glove and everyone was safe, loading the bases with one out. Dempster then walked Edwin Encarnacion to give the Reds a 1-0 lead Dempster got Adam Dunn to strike out, but with two outs, Jeff Keppinger hit a broken bat, seeing eye single that went between three Cubs, and gave the Reds a 3-0 lead. Lou must have been reading this blog, because he finally moved Soto to the fifth spot, before Mark DeRosa. With Ramirez out, Fukudome hit fourth and Soto hit fifth. Soto responded by going three for three with a solo home run in the second to trim the lead to 3-1. Unfourtunately, another error would cost the Cubs another two runs. With two outs in the third, Encarnacion hit a ball to DeRosa that should have ended the inning, but he couldn’t make the play. The next batter, Dunn, hit a ball that still hasn’t landed and the Cubs were down 5-1. As usual, the Cubs fought back, chipping away at the Red’s lead. But the Cubs continued to blow chances. After Felix Pie walked in the fifth, Ryan Dempster bunted into a double play. With two outs, Soriano hit a single. 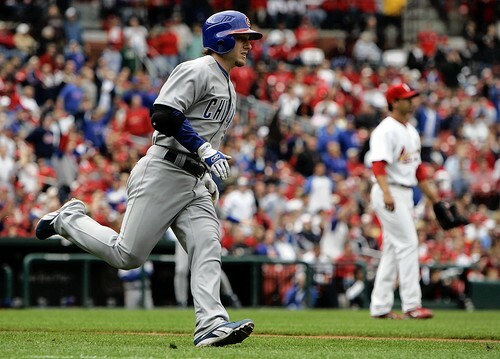 Ryan Theriot doubled, making it 5-2 Cubs. 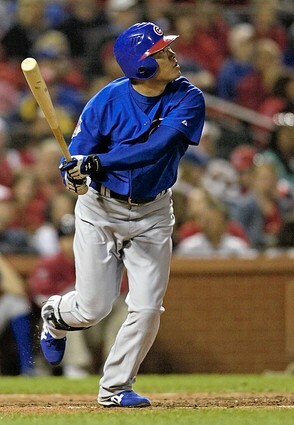 Derek Lee singled, scoring Theriot and the Cubs had a nice little rally going. Unfortunately, Fukudome had a bad game and flied out to right to end the inning. Fukudome was 0-4, striking out twice. Mark DeRosa was even worse, going 0-3, striking out all three times, and leaving three runners on base. His average is now down to .259. The dagger to the heart of Cubs fans came in the ninth. With big free agent acquisition Francisco Cordero on the mound, the Cubs got back to back singles by Fontenot and Pie. Dary Ward lined out on an at’em ball. He hit the ball hard, but right at Corey Patterson. Miraculously, Soriano walked, loading the bases with one out. But then, a slider got away from the catcher Paul Bako, and Fontenot tried to score but was easily thrown out. With two outs, Theriot walked, but Derek Lee grounded out to first to end the game. Now the Cubs are down 1-0, and they face two of the best Reds pitchers in Aaron Harang and Edison Volquez. The Reds had lost five in a row and were reeling. This win took a lot of weight off their shoulders and you can be sure the Reds will be ready to play tomorrow. Our stopper, Carlos Zambrano will be pitching tomorrow, and all the pressure is on him to deliver, and Carlos always struggles against the Reds, especially Adam Dunn. Luckily, the Cubs are not to far out of first, but if this gets much worse, we may need to hit the panic button, The Cubs have to now win the next to games to take the series. If they don’t that will be four series losses in a row, and they will then face the best team in baseball, the Arizona Diamondbacks, at home this weekend. When the 2008 Cubs schedule came out, I wrote in previous posts that the Cubs had to do well during the mid April to mid May stretch, but so far they have failed miserably. All we can do is hope the Cubs get going soon. The boom-or-bust Cubs were a bust Sunday night on ESPN, continuing their pattern of inconsistent play. The Cubs did the right thing by sending Rich Hill to the minor leagues, now Lou has to sack up and make some other tweaks, just like he did last season. First off, Jason Marquis has got to go. He is terrible. Usually he is good for a few months before going into a tailspin. This year, he is just like Rich Hill. You have no idea what you are going to get. Most of the time, it is just bad. Marquis went 5.1 innings, giving up five runs on seven hits and five walks. That’s twelve base runners in 5.1 innings of work. He would have given up more runs if not for a spectacular play by Derek Lee to rob Chris Duncan with the bases loaded and two outs with a diving backhanded catch. The bases were loaded because Marquis walked three batters in the first inning. That’s twice in this series with the Cardinals that Cubs starting pitchers loaded the bases without giving up a hit. I wonder if that’s ever happened in a series before? The Cubs got a 2-0 lead in the top of the second after Geovany Soto doubled and Mike Fontenot walked. Reed Johnson hit an RBI double, scoring Soto and moving Fontenot to third. Soriano flied out to get a sac fly. But then Marquis gave it right back to the Cardinals, After getting Yadir Molina to ground out, Marquis gave up four straight singles to Todd Wellmeyer, Ceasar Izturis, Skip Schumaker, and Adam Kennedy to tie the game at 2. It would have been worse if Pujols didn’t ground into a double play. Then, in the bottom of the fourth and the game tied at two, Marquis screwed up big time. He got the first batter, Wellemeyer, to ground out. He gave up a single to Ceasar Izturis, who is batting .231, but got Schumaker to ground out, moving Iztuis to second. With two outs and Adam Kennedy at the plate and Albert Pujos in the on deck circle, he friggin’ walks Kennedy on five pitches. Predictably, Pujols hit a double, giving the Cards a 4-2 lead. Now Lou, I know you are smart and will make the right decisions like you did so often in 2007. I am here to give you some advise to improve the 2008 Cubs. Number 1- Don’t allow players to determine if they need minor league rehabs assignments. Send them down and don’t bring them up until they can catch up to a fastball. Soriano is doing much more harm then good right now. I have no doubt that Soriano is best served as a leadoff man,but the rust of not playing for a few weeks is really showing. If it continues, look for Soriano to get booed mercilessly during the upcoming ten game homestand. Soriano’s .254 on-base percentage as a leadoff man was the worst among everyday NL leadoff men entering Sunday. Corey Patterson’s .259 was second-worst to Soriano. Number 3-No more Hill, no more Marquis. Please, I can’t stomach it anymore and by reading your lips when those guys are on the mound, neither can you. I know Hill has good stuff, but he can’t handle it in the big leagues. I know that the reason Marquis was put in the starting rotation to begin with was so that he could have his usual hot start and then you could trade him before he started his second half failures, but it didn’t work. Marquis is stinking up the first half now too. Leave Lieber in the rotation and give Sean Gallagher a chance to start. Number 5- No more DeRosa batting sixth. It is obvious that Soto should be batting higher. He has a great eye, has real power, and is driving in a ton of RBI’s. He needs to be behind Fukudome. 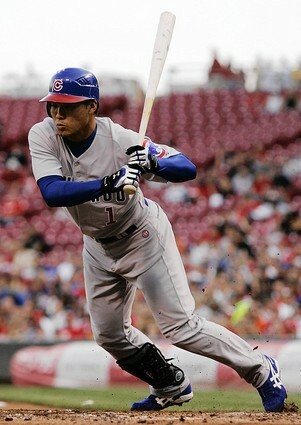 With Fukudome’s high on base percentage, this will give Soto a chance to drive in more runs. The Cubs now go to Cincy for a three game losing streak. The Reds are hurting, suffering a five game losing streak and 3-7 in their last ten games. They fired their GM, are talking about trading Dunn and Griffey, and Baker is already coming up with lame excuses. They are in last place in the NL central. If we can’t take this series, we are in bigger trouble than we thought. As I wrote after Friday night’s loss, this team is much different then many other Cubs teams I have seen over my 25 years of watching Cubs baseball. This team doesn’t use excuses, they don’t hang their heads down after a tough loss, they are always ready to fight back, and that’s what impresses me about the 2008 Cubs. So far, the Cubs have not lost more than two game in a row. I look at our 12 losses, and do you remember any game that we were blown out of? Any game we didn’t have a chance to win? How many of those losses did we have the winning or tying run on base in the ninth? There is something special about these Cubs that barring any horrific injury, they will be a force to reckon with. record-setting crowd of 46,792 at Busch Stadium, and put a whooping on the Cardinals 9-3. After Rich Hill’s horrible one inning start on Friday, the Cubs looked to Ted Lilly to come back and give the Cubs a long start to rest the bullpen. Ted did just that, giving the Cubs seven innings, giving up three runs on six hits, with only one walk and four strike outs. It was a little bit easier for Ted, having all that run support, but he didn’t let the Cardinals back into the game, and the Cubs offense kept adding runs. The big thing is that even though his velocity is not completely back, his mechanics are looking better and he has more command of his pitches. the Cubs loaded the bases in the fourth inning, it was the 14th straight game in which the Cubs have had at least one plate appearance with the bases full, The last National League team to have a streak that long was the 1999 Dodgers, who had a string of 13 consecutive games with at least one plate appearance with the bases loaded. On Saturday they came through with plenty of clutch hits to get those runners home. Fukudome hit 2 doubles with an RBI, Geovany Soto his a bases loaded ground rule double for 2 RBI’s, Alfonso Soriano hit an RBI double, and little Mike Fontento hit a three run homer for the Cubs. All this against Kyle Lohse, who up to Saturday’s game had a 3-0 record. There was no surprise to hear that Rich Hill was going down to Iowa after Friday night’s miserable performance. That brings up Sean Gallagher, who was trade bait for Brian Roberts all winter and spirng. Gallagher struggled in spring training, so he went to Iowa instead of with the big ball club. So far, Gallagher is 2-2 with a 3.10 ERA (10 earned runs/29 innings pitch) in five starts with Iowa this season. He has limited opponents to a .196 batting average, including a .162 average to left-handers and a .214 mark to right-handers, and has struck out 30 and walked only nine batters in 29 innings pitched. He is the reigning Pacific Coast League Pitcher of the Week. Let it be known, you can’t do your job, Lou will find someone that will. Gallagher screws up, he’ll get his bus ticket to Iowa. He stay hot, don’t expect to see Rich Hill anytime soon. Also, who is going to go down when Scott Eyre is back? Smart money is on Chad Fox. That was a bad move in the first place, considering the talent in Triple A. The one good thing out of this Rich Hill fiasco is that Jon Lieber is going to take Hill’s spot in the rotation, and Sean Marshall will continue to be a left handed specialist. So far, Lieber is 2-1 with a 1.86 earned-run average. He looked like one of the best starters in spring training, especially compared to Hill, who struggled all spring. Lieber showed everyone why he is such a class act, telling reporters he is only “holding” the spot for Hill until he comes back. As much as Lieber wants that spot, he is trying tp keep Hill’s confidence up. Lieber is looking like one of the best signings of the off season, even as many questioned the move. I am happy and hope Jon can successfully hold on to that spot in the rotation. As good as Hill can be physically, he just doesn’t have the mental composure to be a big league pitcher. You can tell that Lou has the heart of a champion. Even when this team was having the best April in the 132 year history of the franchise, it was good enough for Pinella. We were winning, but there were problems that needed to be addresses, like Hill’s struggles and middle relief. “Let’s get our bullpen functioning the way we thought it would coming out of Spring Training,” Piniella said. “The Hill thing was always something that was there. Now, we’re sending him out, so hopefully he can get back here and soon. Ok, so tonight pitching matchup on ESPN’s Sunday night baseball leaves a lot to be desired. In the rubber match of the series, the Cubs will take on the Cardinals with first place on the line. Ex-Cardinal Jason Marquis will face off against ex-Cub Todd Wellemeyer in a battle to see who stinks less. The Cubs could really put a hurting on Wellemeyer, so let’s hope we take back what is ours! 2. Zambrano played a marvelous game, He pitched 6 1/3 innings, gave up one run and two walks, striking out three. He also hit a home run, tying Fergie Jenkins for most home runs by a Cubs pitcher. The Cubs had three games against Milwaukee and three against St Louis. 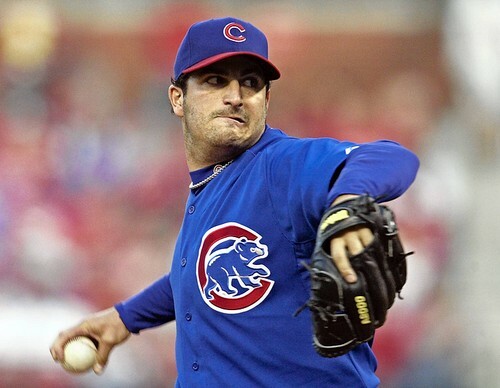 Zambrano is not going to pitch against the Red Birds, so this great start against a division rival was wasted. 3. The Cubs had the lead in a game I was very worried about. Anyone who watches baseball knows what a great young pitcher the Brewers have in Yovani Gallardo, but we were able to take a 3-1 lead into the ninth. Last year, or most Cubs teams in the last (pick a number) years would not have been able to have been as patient and put runs across the way our offense did. 4. Lou Pinella blew it. Nobody is perfect, not you, not me, not anybody. I’ve heard it said that managers decisions are usually responsible for the outcomes of roughly eight games., meaning that in 8 out of 162 games, a decision a manager makes wins or loses his team a game. Today was that day for Pinella and he knows it. During the very short post game interview with the media, Lou was asked if he “considered” having Reed Johnson, a more able defensive player, in left instead of Soriano. It was Soriano’s first game back in two weeks and Johnson had made one of the most fantastic catches in the history of baseball a week before in Washington. Yet in the top of the eighth inning, Lou took Johnson out of the game and replaced him with Felix Pie. There was nothing wrong with having your best defender in center with a 3-1 lead, but why, why, why didn’t Lou move Johnson to left and take Soriano out of the game. Soriano has alway been a poor defense outfielder. He doesn’t read the ball off the bat well, he takes poor routes to balls, he does a stupid little hop to catch balls, and he’s scared of bumping into the wall. The only thing he has going for him is a cannon for an arm. And it’s not like Soriano was having a monster offensive game. He went 0-4 with 3 ground outs and one pop fly. With a runner on first and no one out in the ninth, pinch hitter Gabe Kapler hit a ball that should have been caught for the first out, but it went over Soriano’s head, putting runners at second and third with no outs and a two run lead. So was Lou having any second thought about that decision? Lou was a second away from a full fledged meltdown. You know why? He knew it. He should have trusted his gut and put Johnson in right. But he didn’t. 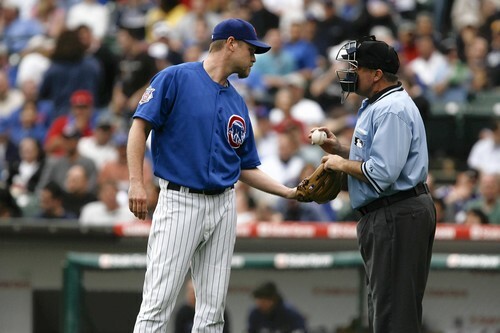 Of course it didn’t help that Kerry Wood was awful today. A few posts ago, I wrote about how Kerry Wood as closer was the second coming of Mitch “Wild Thing” Williams. He may be brilliant one day, horrible the next. Today he was horrible. He hit the very first batter he faced in the ninth, Craig Counsell. I know Counsell is a clutch player, but he was 0-3 and is batting .275. You know how it ends when you walk, hit, or give up a single to the first batter in the ninth. It’s just going to end bad. After the hit by pitch, Kapler hit the ball that landed over Sorinao’s head. Theriot made a decent play to keep a line shot from reaching center field, but Counsell scored and Kapler moved to third. Wood then walked Ricky Weeks to load the bases. He struck out Mike Cameron for the first out of the inning, but gave up a double to Ryan Braun, and Ricky Weeks was thrown out at home by Fukudome. The Brewers took a 4-3 lead and that was it for the Cubs. Point number one, as much as it pains me to write this, Soriano is the best option in the lead off spot. You can argue with me until you are blue in the face, but that’ s just a fact. Can it be annoying when Soriano is slugging for the fences when he just needs a single? Yes. Is it annoying when he doesn’t take any ptches? Yes. Is it discouraging that he always swings at high fastballs or brreaking balls that are low and away? Absolutely. But he is a very dangerous hitter, and when he gets going, he can carry a team. He started out bad in April last season and then was out until the end of May with a quad injury. When he came back, he carried the team on his shoulders in June and July. He was flat out hitting everything. Then, on August 3rd, he injured his hamstring. The Cubs cooled off considerably until he came back in September. Soriano went on another tear, propelling the Cubs to the 2007 Central Division title and the playoffs. Reed Johnson is never going to do that. However, I am very annoyed at the fact that Soriano felt that he didn’t need any minor league starts. When did the players start dictating their recovery methods? You haven’t seen live pitching in two weeks, then you are going to start out against a phenomenal pitcher like Gallardo? Was anyone shocked that Soriano went 0-4. How hard would it have been to take a few minor league rehab starts and get your swing going? It’s not like the Cubs desperately needed Soraino to come back. They score 19 friggin’ runs the day before. Why not go to triple A, and when you feel warmed up and you’ve hit the ball well, come up and help? So instead he is going to rehab in games that count? How long does Lou wait for Soriano’s rhythm and timing to return? lineup, Weeks and Cameron. He then faces the most difficult part of the order in the eighth; Braun, Fielder, and Corey Hart. Only Corey Hart reaches, on a bunt single. The next batter is Bill Hall, who flys out to end the inning. So for all you people who want Marmol to be the closer, who did you want pitching to get out of that jam in the seventh and face the heart of the order in the eighth? Kevin Hart or Michael Wuertz??!?! That were great on Tuesday night. (dripping with sarcasm) Bob Howry, who gave up a two run homer to back up catcher Mike Rivera (who?!) on Wednesday night? Exactly. Today’s game was set up perfectly. All Wood had to do was get out Craig Counsell who was 0-3, striking out twice and flying out once, pinch hitter Gabe Kapler, who was making his first at bat as a pinch hitter, and Jason Kendall. Even if one of those guys gets on, you have Ricky Weeks, who is batting .204. As I said before, there will be days when Wood is brilliant, and days when he is horrible. If someone has a better suggestion, I am all ears. Realize this though, take Marmol out of his role of fire extinguisher, and you won’t have many leads to hand to the closer. You would have already have given them up. The dangerous situation now is that the Cubs must go St Louis to face the red hot Cardinals. Picked by many to finish last in the division, the Cardinals are now alone in frist place with the Cubs .5 games back. Bradon Looper will face off against (gulp) Rich Hill!! Who’s feeling confident? Not me. The Cubs were able to bounce back after Tuesday nights disappointing defeat, can they do it again on Friday. The Cubs have lost 5 of the last 7, and everyone of those losses was a game we should have won. You lose a few more and we’re in some trouble. We are going to rely on Rich Hill, Ted Lilly, and Jason Marquis to turn this thing around against a very hot team. Let’s hope we have a miracle this weekend. A night after getting pushed around by the big bad Brewers, the Cubs pushed back in a big way, pounding the living daylights out of Jeff Suppan, Derrick Turnbow, and the rest of the Brew Crew 19-5. That win gave the Cubs a 17-10 record for April, the most wins in April in franchise history. The previous high was 16, set in April 1969. The Brewers had to be filled with confidence after Tuesday night’s victory, but the Cubs gave them a beat down they won’t soon forget. The Cubs score 19 runs on 15 hits with no errors. The Brewers only had 5 runs on six hits with one error. Ricky Weeks had two hits, Ryan Braun had two hits, Prince Fielder had one hit, and Mike Rivera had one hit. After the fifth inning, the Brewers cried “Uncle” and Ned Yost pulled out a bunch of his starters, including Fielder and Braun. Starting pitcher Jeff Suppan gave up 11 runs on 11 hits in only 3.2 innings. The Cubs got six runs in the first, when Reed Johnson and Ryan Theriot reached base, then Derek Lee doubled, A-Ram doubled, and Geovany Soto hit a three run homer to left field. Soto would hit another three run homer later in the game, giving him 6 RBI’s. DeRosa had RBI’s in the third and fourth inning, Ramirez added an RBI in the fourth, and SI cover boy Kosuke Fukudome had one in the sixth. The eighth inning was a bizarre one for Derrick Turnbow and the Brewers. Turnbow came into the game in the eighth inning and got the first batter, Henry Blanco, to strike out looking. He then walked Mark DeRosa and gave up a single to pinch hitter Mike Fontenot. With runners at first and second, Felix Pie flied out for the seocnd out of the inning. With two outs, Matt Murton hit a single, scoring DeRosa. Turnbow would walk Johnson, to load the bases. Turnbow would then walk Theriot to force in a run. Ronnie Cedeno then hit a double to clear the bases. The damage still wan’t done as Daryl Ward hit a double to drive in Cedeno. Henry Blanco, who started the inning, drew a walk. That was it for Turnbow, as he gave up six runs on four hits and four walks. Dempster was fantastic tonight, improving his record to 4-0, giving up three runs on four hits and striking out one over six innings. Bob Howry gave up a two run blast to Mike Rivera in the seventh. Carlos Marmol and Michael Wuertz both threw scoreless innings. If you would have told me that Dempster would be 4-0 in April and be one of our most consistent starters, I would have laughed. He is proving a lot of people wrong so far, myself included. 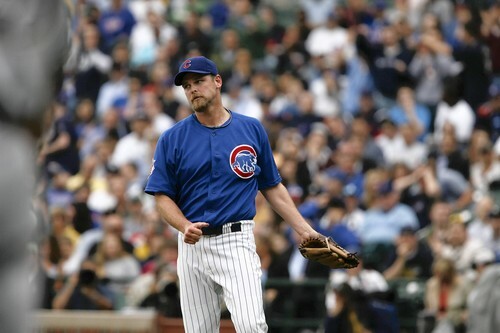 This was a huge win for Dempster and the Cubs. 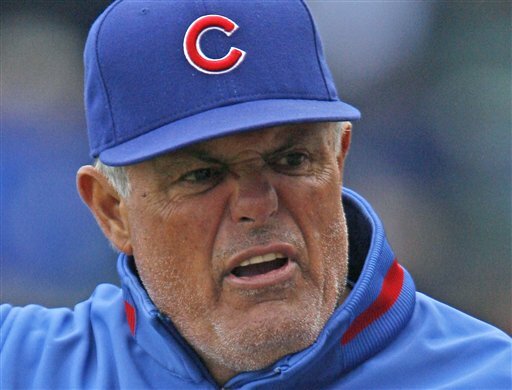 The Cubs had lost 4 of their previous five games, Lou was very testy with the media today, and morale was low. Not anymore. Now comes a huge match up in the series, Carlos Zambrano versus Yovani Gallardo. Like the old saying goes, I hope the Cubs left something for tomorrow. Gallardo is a great young pitcher and the Cubs will have to be patient. The win tonight puts the momentum back in the Cubs corner, with the Brewers needing to respond to what happened Thursday night. Z just shaved his head, so let’s see if that makes him more areodynamic. How nice would it be to start May on a winning note, taking the series against the Brewers? Let’s hope the Cubs have another day like today. Either way, the Cubs showed that they have muscle too and I am sure both clubs will continue to battle each other throughout the season. We really needed this win.